You work with what you have, and Nancy Reagan apparently will live or die on 80s fashion. She’s taking her old dresses, borrowed, donated, and occasionally paid for, and putting them on display at the Reagan Library. It’s a bold move. 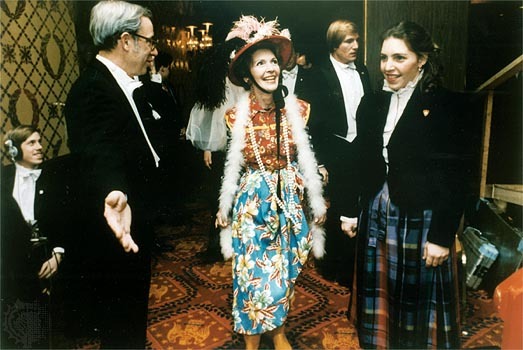 Under heavy flack in Reagan’s first term for accepting oodles of free [and not cheap] dresses, Nancy rounded on her critics by singing “Second Hand Rose” to DC establishment hacks at the Gridiron Club. Result? Charmed press corps rushed to embrace “laughing at herself” narrative, controversy defused. And in some tellings the end of the story. But she kept taking free clothes! Now we get to witness the “86-year old philanthropist’s wardrobe” when she puts what she’s kept on display. It presumably increasing their value as eventual donations for tax deductions, and gives one last bump to the free-bee dispensing designers she favored. This entry (permalink) was posted on Monday, October 8th, 2007 at 9:19 AM by mr.president and categorized in FIRST LADIES, HISTORY IN THE NEWS, PRESIDENTIAL HISTORY, PRESIDENTIAL LIBRARY, PRESIDENTIAL SITES, RONALD REAGAN, US PRESIDENTS.